11/08/2018 Update: Blogmutt changed to “Verblio.com”. Bonny Harper recently did a guest post on Real Ways to Earn Money from Home about Blogmutt, a site that pays you to write blogs posts for their customers. There are a few things that make Blogmutt different from other ghostwriting sites, however. This post will provide more information on Blogmutt. As I mentioned previously, Blogmutt is a site that pays you to write blog posts for their customers. They do things a little differently from other ghostwriting sites however – instead of listing different work orders for their customers, they list information on their customers, such as what kind of blog posts they’re looking for, including the different keyword phrases they’re looking for, and the blog post length the customer prefers. Each customer’s profile also includes a link to their blog, and you can also see what blog posts have been published, and which have been rejected, so you can get a better idea of what the customer is looking for. Do I have to include any keywords in my blog posts? Yes, when you choose to write a post for a specific client, you’ll have to choose a keyword phrase that you’ll include in the title and at least once in the body of the blog post. In addition, many clients also require a “Contact us” link to be included at least once in the body of the article. How much are you paid for each blog post? You’re paid a flat $8 for each blog post that’s accepted, no matter how long the blog post is. When and how does Blogmutt pay their writers? You’re by Paypal after you reach $100 in earnings, or by the end of the month for the posts you have written and that the customer has accepted, whichever comes first – however you must send Blogmutt an invoice in order to get paid. What if my post is rejected? Very few posts have been rejected, but if the client rejects your blog post, you can re-write it and submit it to another client, or post it on your own blog if you have one. Is there any support for Blogmutt writers? Yes. Once you’ve written your first post, you’re given access to the Blogmutt message board, where you can interact with other Blogmutt writers and ask questions. This is the place where you’ll also get updates from the owner of the Blogmutt site on new customers, or about new features that have been added. Do I have to write a certain number of posts each month? No, there is no minimum number of posts you have to write, however Blogmutt does have a unique feature that allows you to set a personal goal of how many posts you want to write per month, and you’ll be able to see how far away you are from achieving your goal on Blogmutt’s dashboard. Are there any other things make Blogmutt different from other ghostwriting sites? You also earn points for different things you do on the Blogmutt site, such as writing posts and when your post is published by a client, as well as other goals. As you earn points, you’re promoted to higher levels – at certain levels you’ll earn different honors, such as invite-only LinkedIn honors for success as a professional writer, and the opportunity to be part of a select group of writers that has access to higher-paying work. How do I sign up to write for Blogmutt? Just click here to start the application process. Great review, Erica. I also like the name and tagline of the company. Sounds like it might be worth a look. I found you from LM5. What a great site you have! 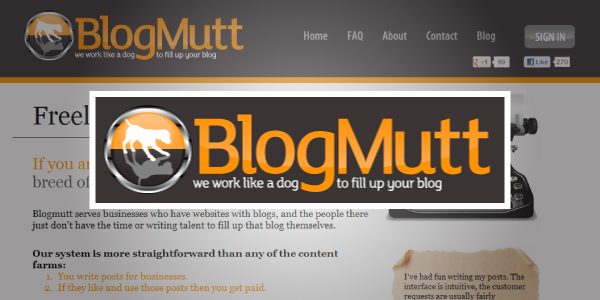 I can’t wait to explore blog mutt and some of your other resources! Have you checked out the 10k challenge yet? I’ve been writing about it on my blog. I applied a couple days ago. I hope to hear back soon! I would really love the chance to do this. I work part time out of the home and looking for ways to make that amount or more (of course) from home so I can quit. I need to make enough for student loans. Not many wah jobs seems to fit for me, but this one looks promising. Thanks for the info. I just got an “accepted” from Scott! I’m very excited what else lies ahead. I’m a small cale blogger, but this is my first ghostwriting site I’ve applied to. Lately I’ve been looking into different options to generate small online income. Sites like yours have helped me get a good idea of what it takes. Thanks for the review on BlogMutt. I’ll let you all know how it goes. I am a writer for Blogmutt and can tell you its worth your effort to do it. One error in your post is the pay there is now no minimum threshold or payout time its every Monday and whatever you invoiced. Recently I was fired from Blogmutt. After a dispute with a very rude customer I exchanged about a dozen emails from staff. Without warning, Scott Yates told me by email I was on a 6 month suspension and to find something else to do. He said he would relay to the new CEO what changes I made in my life and they could decide to let me back or not. I threatened to sue and Scott told me they make very little money and that it would hurt them. The have 14000 writers and while customers pay around 18 an article writers get 8 for the crap they endure as they climb over each other to get a customer to buy work. Apparently I was fired for taken more staff time than the profit they earn from my work. My request for staff assistance apparently cost more than the staffs salery or something along those lines. I hate to hear that. Thank you for the information! Seems like they changed to “Verblio.com.” Please consider an update on this 🙂 Thank you. Updated. Thank you for the notice!